If you’re in Brisbane for work and your day is filled with scattered meetings across the city, you might be looking for a way to kill time in between. Rather than going back to your hotel room for a few hours, why not get out and see what the city has to offer? Over the years Brisbane has blossomed into a cultural capital of Australia, lined with coffee shops, rooftop bars, book shops, art galleries and markets. There’s so much to do in Brisbane, so read on to discover the best way to fill your time between business meetings. There are several art galleries spread across Brisbane, and none better than the Gallery of Modern Art – better known as ‘GOMA’. This sleek and stylish gallery is considered one of Australia’s most innovative art spaces, with one of the greatest collections of Asia-Pacific art in the world. The gallery is filled with 16,000 pieces, so whether you have just a short hour’s break or several hours before your next meeting, you’ll be able to feast your eyes on some brilliant pieces. GOMA is located right on the Brisbane River, beside the State Library of Queensland, and has a great little cafe out the front for a cheap bistro meal while looking out onto the River. James Street has almost everything in one street. If you’re after a coffee or something to eat, you’re spoilt for choice along this street. Gerard’s Bistro offers unique flavours from the Middle East, North Africa and Europe, while Bucci is the king of Italian food. If you prefer fine Asian cuisine, The Chow House is the place for you. Already eaten? Why not splurge on some shopping. James Street is home to big name brands including Zimmermann, Camilla, Aje, Aesop and Mecca Cosmetica. You can also visit Scruptuous Reads, a boutique cookbook store, or stop into the Health Place for a quick massage. For a lesson in the history of the city, check out the Museum of Brisbane. The museum explores the ordinary people and places of Brisbane, uncovering fascinating and deeply moving stories that provoke thought. The 100% Brisbane exhibition has been open for nearly a year now and is free to enter. It features a collaboration with Berlin based theatre company Rimini Protokoll to create an interactive experience uncovering the beliefs and attitudes that shape the people of Brisbane, and is open 10am to 5pm every day. If you’d rather experience the natural beauty that Brisbane has to offer, get out to Mount Coot-tha. 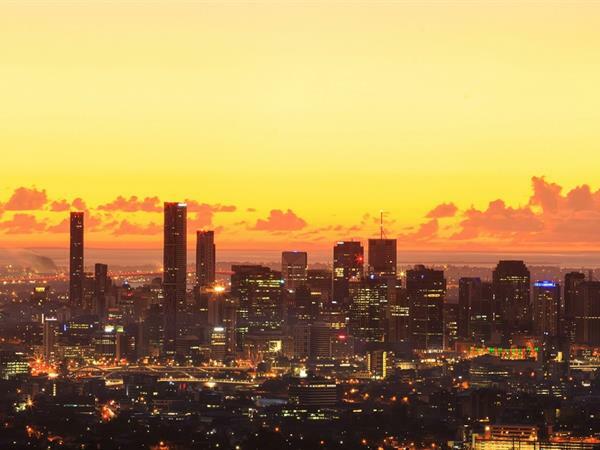 Roughly a 15 minute drive out of the CBD, you can get a spectacular panoramic view of Brisbane all the way out to Moreton Bay from the lookout. If you’re combining this trip with your lunch break, the Kuta Cafe has an all day menu from 11am, or for something a little bit fancier, the Summit Restaurant is open everyday from 11.30am with a menu featuring contemporary Australian cuisine and seasonal produce. If you don’t have time to go to the summit, visit the Botanic Gardens at the foot of Mount Coot-tha, where you can take a leisurely, self-guided walk through the subtropical gardens. For discount shopping in Brisbane, you can’t go past the Direct Factory Outlets (DFO). Located in the Skygate precinct by Brisbane Airport, the centre is open from 10am to 6pm daily. With brands such as Roger David, Review, Mimco, Wittner, Witchery, Peter Alexander, and many more, you can pass the time between meetings with a little retail therapy, at a discount. Or if you’re looking for a gift to remember your time in Brisbane, check out Southbank’s famous markets. A tourist hot spot, they’re located in Stanley Street Plaza and have several colourful stalls selling anything from handcrafted jewelry, to art and gourmet food. The food scene in Brisbane is booming, so if you have a break over lunch, make sure to head into the CBD or Southbank for a meal. E’cco is one of Brisbane’s oldest and best restaurants located in a former historical tea warehouse. For picturesque views of the Story Bridge and Brisbane River, Aria and Alchemy are great choices. Or for something a little different, Sake on Eagle Street Pier is known for innovative and contemporary Japanese food. If you’re travelling to a new city for work, checking out the local hotspots and making the most of your time there is a must. Brisbane is full of surprises. With world class restaurants and views, good shopping and interesting art displays, there’s plenty to in between business meetings in Queensland’s capital.